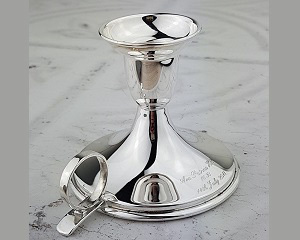 The David-Louis Christening Candle Holder is a solid but some how delicate and precious piece of craftsman ship, created independently using silversmithery of the Birmingham locale. What makes this candle holder so wonderful is that you can have it engraved for no extra cost with your very own words, which would render it a completely unforgetable gift to last a lifetime. This candle holder is simply a brilliant gift to bestow upon a christened child.